The TourGuide Handlebar Bag by Topeak is a full-featured handlebar bag for touring, day trips, or commuting to and from work. Using Topeak's QuickClip™ system, the TourGuide Handlebar Bag can be easily attached and removed with the simple click of a button. The bag features a large divided main compartment to keep your belongings organized, a front zippered pocket, two side zippered pockets for items you need readily available, and a clear map pocket for those adventurous days. 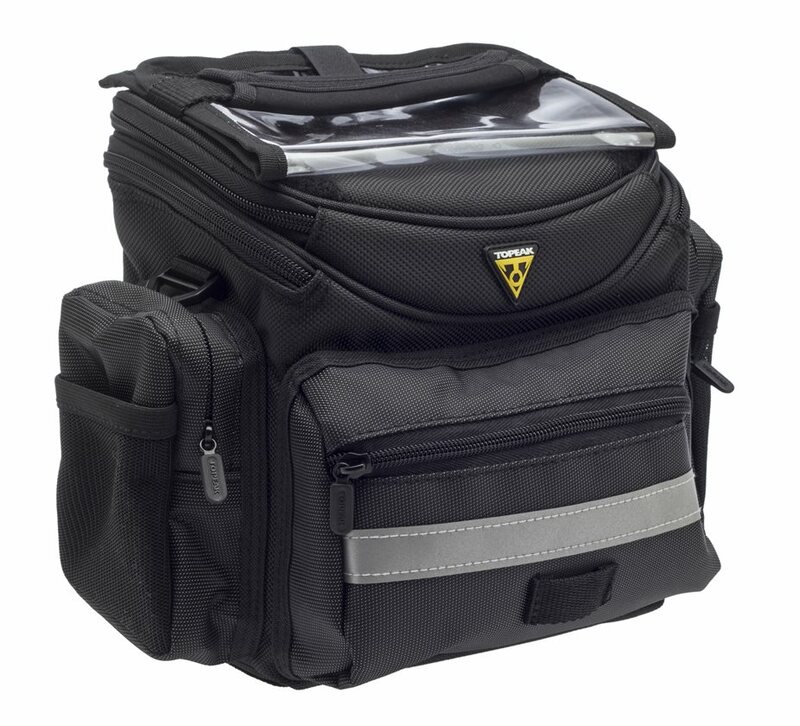 No need to worry about losing out on valuable handlebar space, the TourGuide Handlebar Bag includes cycling computer and front light mounts so they can be mounted alongside the bag. The TourGuide Handlebar Bag also includes a rain cover for those wet commutes, and with a large 305 ci carrying capacity, its ready to be loaded up and taken on a 2-wheel adventure! Seems like before any tour be it long or short, one of the challenges is how many pockets do I need and what goes in which. This little answers most of those questions. Its capacity is listed at 5L and 305ci. That last volume descriptor is misleading even tho it's true.it calculates to only 0.17 cu ft. Not much? The interior main compartment dimensions are about 6" tall x 6.5" x 4" with a separate zippered compartment plus velcro divider. The top lid, which also has a folded map sleeve, is its own compartment with plenty of room for your phone, wallet, etc . On each side you see a zippered pocket with webbing. Good for snacks, money, etc. And across the front, a long narrow pocket. All the interiors are felted so your goodies are protected. With the clip system, the attached bag doesn't interfere with brake and derailleur cables. Also included is a strap if you want to carry the bag with you instead of leaving it on the bike. And don't forget the rain cover. So, you have plenty of opportunity and options on where to put your small stuff that keeps them close and handy. The bag is durable and has a decent stiffener so it doesn't sag. There are plenty of spacers to fit your handle bar diameter. If it wasn't for that use once cable after thought to keep the bag from sagging if you've put too much stuff in it, I'd be giving it 5 starts. I never thought I'd be paying this much for a handlebar bag but..... this one is worth it. If you're thinking "that might be handy to have," you're right.